Dragonmeet 2011 has been and gone, and many were the revelations! 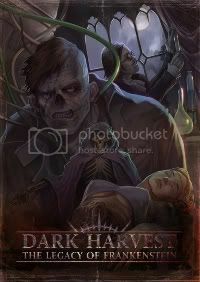 During the event, held once again at the Kensington Town Hall in London, various Dark Harvest – related shenanigans occurred. A new product was being playtested for the first time outside of the developer’s inner circle and, at the last seminar of the day, other new projects were revealed or better defined. Over the next little while, both here and on our Facebook page, you’ll get to read more details on our cunning plans, and also have a chance to participate directly in shaping the new products – something eight players did at Dragonmeet yesterday. In the meantime, here’s the basics. This one you already know about. We’re still on course for a May 2012 release. Folks at Dragonmeet got to see Sara Dunkerton’s six page opening comic, something that will not be revealed again until the final release of the book. However, more solid details of the other contents will emerge over the next few months. Working title, obviously. This is what was being tested at the convention, and it will be tested again in the near future with various other willing victims. We’ll let you know when and where so you have the chance to join in. It’s not a CCG or any such thing; more a sort of after dinner, during drinks kinda thing. It’s a bit more light-hearted than the usual DH stuff, and is currently being tested with between 2 and 6 players. It’s strategic, devious, cruel, funny and entertaining. More info to follow! As many of you may be aware, Cubicle 7 have launched a fiction imprint. The first book in this range, a Mindjammer novel by the very excellent Sarah Newton, is out both as an e-book and – launched at Dragonmeet – as a paperback. I’m delighted to say that, pending the usual contractual and organisational stuff, a Dark Harvest: The Legacy of Frankenstein Anthology will be one of the titles in the near-ish future. Short fiction has always been, and will always be, an important part of DH:LoF. We’re lining up a great bunch of writers to bring you an amazing mix of stories from Promethea that will add detail and flavour to the world and to your games. I’m looking to add website content based on those stories to allow you to bring across elements from the fiction, linking the two as closely as possible. Guess what? Yup – more details to come as we get it all worked out. Yup. There’s a couple of other related projects that still have to be kept under a big tarpaulin in the Garage of Greatness, slowly leaking the Oil of Awesome onto the Floor of Wonder. Or, erm… something. So, yes. Details. Later. Stuff. Thanks to everyone at Dragonmeet; organisers, staff, the person who left a hair at the bottom of my tea cup, players, everyone at Cubicle 7 and, gosh, well, just everyone! 3 Responses to Secrets Revealed!